In May 2010, I purchased a Toshiba NB305-410 netbook for my portable use. The actual part number is NB305-N410BL. It is used to run OpenBSD and it does so very well. Note that there are several drivers missing for this hardware in OpenBSD 4.7; especially the video chipset which is required to run X11. OpenBSD -current as of July 2010 has full support for all hardware. The main reason I got this particular netbook was for the keyboard and the relatively large trackpad. The keyboard is very easy to type on, especially for a netbook. 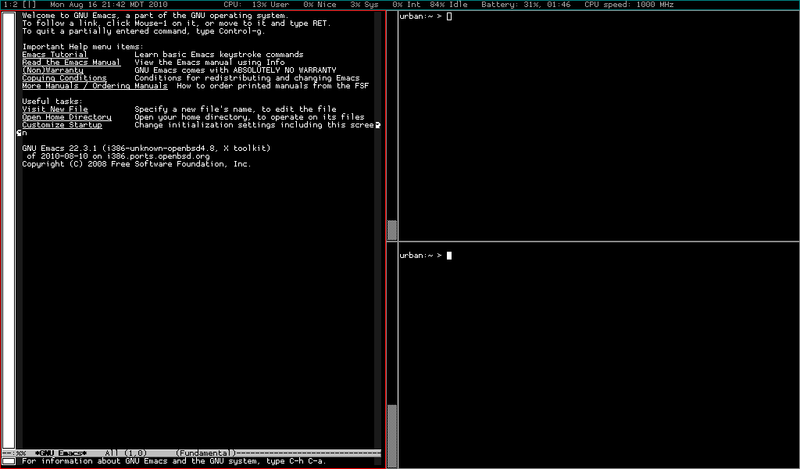 Screenshot showing the Scrotwm tiling window manager. The CPU is an Intel Atom N450 running at 1.67GHz. The Intel Pineview video is part of the Intel Pineview chipset. Support for this chipset was added in July 2010. The Realtek 8101E gigabit ethernet interface is supported under the re(4) driver. The Atheros AR9285 802.11a/g/n wireless interface is supported under the athn(4) driver. While the volume is a bit weak on this netbook due to the small speakers, sound works fine. Most of the function (Fn) modifier keystrokes such as Fn+F6/F7 (screen brightness), Fn+F3 (sleep / suspend to RAM), and volume keys work. apmd(8) and apm(8) work to automatically or manually control the speed of the CPU. Suspend to RAM (sleep) with zzz, apm -z, or Fn+F3 works fine.